Considered as many as favorable hangout spot, our shop received frequent visit by the good fellas from HOW Jakarta. What started out as nonsense banter at the shop ends up in this product: a rolltop bag named "Deny", designed to my requirements. Ahey! Driving in Jakarta could be quite stress inducing, thats some of the reason why I prefer riding bicycles as long as I don't have to take another person along with me. 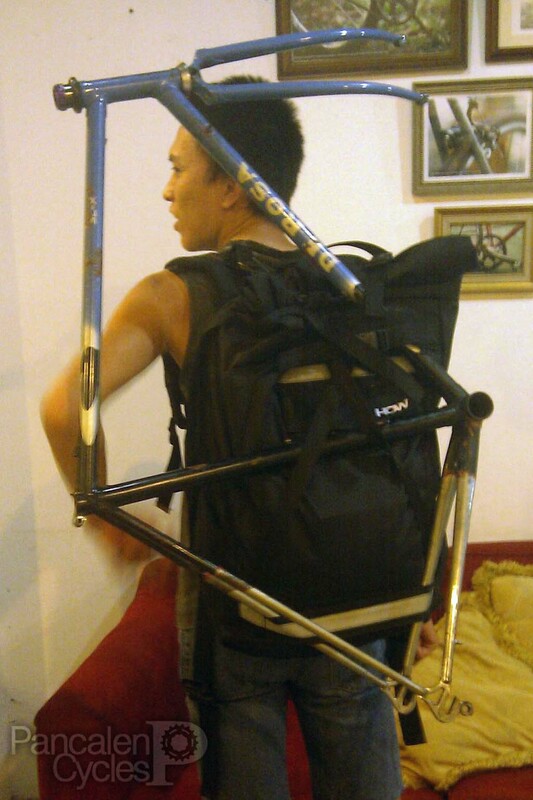 You can see me carrying everything on my messenger bag, from weekly groceries, parts and shop supplies, to full-on frameset. But even my bag is a bit lacking on volume. 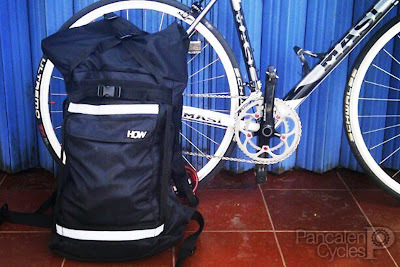 What started as jokes and chit-chats with HOW Jakarta turned out as a sketch for a rolltop bag, and the Deny was born. The Deny have a lot of interesting features. The adjustable main strap (or, as they call it, "stabilizer strap") come in handy when you have to expand this bag to its maximum volume. The secret compartment is nifty, but since it was secured only with Velcro ribbons I wouldn't put anything electronics in there. So where did I put my trusty HP Pavilion? On its laptop sleeve, of course. The sleeve is conviniently located directly to your back to provide excellent weight distribution. The padding is sufficient, you'll barely feel the presence of your laptop apart from its weight. Another interesting feature we infused to this bag is its velcro strap. The first intention was to use it to hold skateboards (hey, I don't ride skateboard, but maybe you did), but turns out the strap is come in handy when you have to carry other stuffs, such as frameset. The small straps holding the rolled top (when not in use) is extended all the way down to the base of the bag so you can use it as tie-down strap to hold almost everything. It is extremely versatile as long as you're creative enough to put them to use. This guy is the owner of one of our builds. Hint: his bike is blue. Interested in having one? 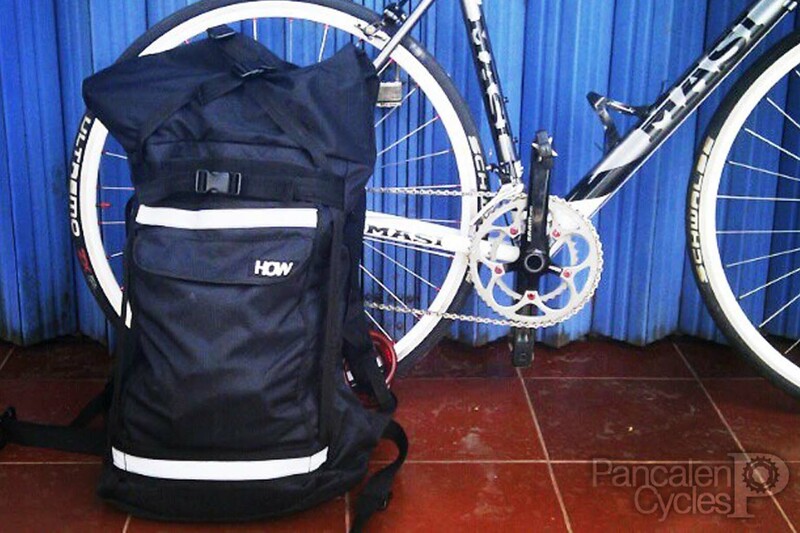 The first production batch of this bag is already sold out. But don't worry, HOW Jakarta is planning to produce the next batch soon enough. head on to their contact page for more details. masih ada nggak om rangga panji? berapaan ya harganya? wah, sold out. tunggu batch berikutnya bulan Juli ini. keep in touch!